FILE - Russian President Vladimir Putin and U.S. President Donald Trump talk as they arrive for the family photo session during the APEC summit in Danang, Vietnam, Nov. 11, 2017. US President Donald Trump spoke with his Russian counterpart Vladimir Putin for more than an hour Tuesday, touching on a broad range of topics, including Syria, North Korea, Afghanistan and Ukraine. A readout provided by the White House said the two leaders had discussed plans "to peacefully resolve the Syrian civil war, end the humanitarian crisis, allow displaced Syrians to return home, and ensure the stability of a unified Syria free of malign intervention and terrorist safe havens." They also discussed ways "to implement a lasting peace in Ukraine." The Trump-Putin phone chat came a day after the Russian leader summoned Syrian leader Bashar al-Assad to the Black Sea resort of Sochi to discuss a Kremlin proposal for a political settlement of Syria’s civil war that has killed 400,000 people, and a day before Putin discusses Syria at a summit with Turkish President Recep Tayyip Erdogan and Iranian President Hassan Rouhani. Putin was also reported to have had a phone conversation Tuesday with King Salman bin Abdulaziz of Saudi Arabia, Iran’s chief foe for influence in the Middle East. Putin has taken an increasingly prominent role in efforts to end the conflict following a two year Russian military campaign that helped the Assad regime fend off opponents, including some rebel groups backed by Washington. Several Middle East scholars and analysts say Putin’s high-profile diplomacy is aimed at establishing the Kremlin as the key player in the region, alongside its ally Iran. 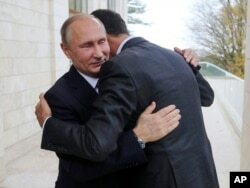 Russian President Vladimir Putin, left, embraces Syrian President Bashar al-Assad in the Bocharov Ruchei residence in the Black Sea resort of Sochi, Russia, Nov. 20, 2017. “The Russians’ main goal is to come back as a big player. They’re taking advantage of the United States absence in the Middle East,” said Hanin Ghaddar, a visiting fellow at the Washington Institute for Near East Policy. “The lack of a US strategy or plan or presence in the region is perfect for the Russians because they are filling the gap instead of the United States, taking the initiative and holding conferences and leading all these groups to come up with a peace initiative. It gives them a lot of leverage,” Ghaddar told VOA. Analysts say Tuesday’s lengthy Trump-Putin phone conversation was a follow-up to informal chats the two leaders had last week on the sidelines of a Southeast Asia summit in Vietnam. “The most important development in terms of the role of Russia and the United States came during the quick meeting on the summit sidelines,” said Mouaz Mustafa, executive director of the Syria Emergency Task Force. “President Trump mentioned at that time that he supports a plan under (United Nations) resolutions, essentially endorsing the Russian plan for Syria,” Mustafa told VOA. A round of U.N.-led peace talks on Syria is scheduled for November 28 in Geneva. Acting Assistant Secretary of State David Satterfield argues that the United States does have a strategy in Syria. At a press briefing on the sidelines of the recent UN General Assembly meeting, Satterfield outlined Washington’s priorities. “Defeat (the Islamic State); priority. End the violence; priority. Basic stabilization to address the humanitarian situation in Syria produced by the violence. And allow the return of displaced persons both within Syria to their homes but also from outside Syria back into the country,” Satterfield said. But the United States is widely seen as operating from a position of weakness. In a recent article for Foreign Policy magazine titled “Thinking Through U.S. Objectives in Syria”, analyst Dan Nidess argues that after a decade and a half of half-hearted commitment and unclear objectives, the Trump administration has no good options. “Reaching a clear decision on what our priorities are will be essential to guiding our actions,” Nidess wrote. He argued that the Trump administration faces difficult choices that reflect competing U.S. interests in the region. “It’s the quintessential dilemma, a collection of pretty unsatisfying options,” Nidess concluded. Scholar Hanin Ghaddar describes this moment as an inflection point in Syria, one in which Iran’s influence is rising and Assad seems to have solidified his hold on power. “This is a new phase. The fight is over, ISIS is defeated, the land bridge is complete,” she said. The “land bridge” refers to an Iranian project to establish a Shia-controlled corridor from the Iraq-Iran border to the Mediterranean Sea and the border with Israel. News agencies have reported that Iran has taken control of Syria’s vast energy resources after pushing out Islamic State fighters from the strategic northeastern province of Deir ez-Zor, where most of the country’s oil and gas fields are located.